Premium Coffee and Chocolate Gift Basket with grinder. This amazing aromatic Gourmet Coffee and Decadent Chocolate Basket is an absolute must if you're looking to impress a business client or a coffee lover. 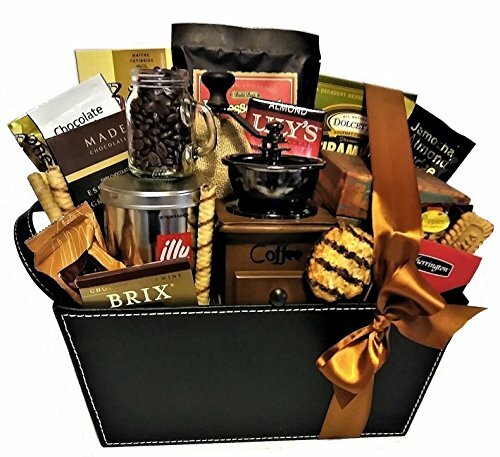 Featuring a Gift boxed Coffee Bean Grinder, Whole Coffee Beans, 2 Varieties of Flavored Ground Coffee, Expresso Coffee, Chocolate Covered Exresso Beans, Coffee Candy, Belgian Chocolate Coconut Macaroons, European Chocolates, Tiramuso Wafer Cookies, Biscoff Cookies, Coconut Chocolates. Wrapped with clear cellophane, tied with satin ribbon and your gift message card..
A premium gift for business gifting.